Sparring is the safe equivalent of fighting for your life! It is testing your marital art skills against another person in a controlled environment. Depending on your dojang, you may participate in any or all of these styles throughout your studies in Taekwondo. Each different style deserves its own consideration. It teaches students how to use distance to control their own attacks and defenses. It teaches blocking and kicking techniques (actually trying to hit a target rather than just the air). It teaches control of one’s own techniques. It teaches control of emotions – how to remain calm under pressure, how to think while you are being attacked. It is a great fitness exercise! All your techniques should be executed with control and skill. In full-contact sparring it is tempting to go at your opponent or partner with full force, but – both in practice and in competition – control is required. In fact, one competition strategy is to get an opponent to exert all his energy into kicking his hardest and fastest, and then to dominate him when he tires. So it had better not be you losing steam and thus losing the match! Full-contact sparring is often called “sport style” and is the style many WTF schools use. “Full contact” means that you can be hit by kicks or punches in the approved areas of your body –areas protected by a chest protector (hogu) and a helmet (for belt divisions that allow head kicks). Kicks and punches are allowed only from the top of the hip bone to the collar bone. All competitors are expected to wear full equipment when sparring. 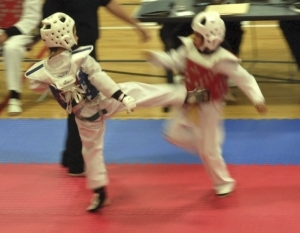 All Taekwondo competitors are expected to exercise control over their actions; they score points by kicking or striking the chest protectors of their opponents. A properly executed kick that strikes in a legal target area is awarded one point. A more difficult kick (one with a turn or twist) may score more points, depending on the rules of the competition. The spine and back of the head is not a target area. A kick to the head earns a point only in adult black belt divisions at most WTF tournaments. A well-executed, controlled kick to the head will score extra points in a WTF regulation competition (such as the Olympics). Throwing, elbow strikes, grabbing, or head-butting is not allowed. Only straight-on punches can be scored; backfist punches and elbow techniques are not allowed. A competitor must stay in the playing surface area and may not intentionally fall down during a technique or to avoid a kick. To read the entire WTF rules, click here. In light-contact sparring, as the name implies, competitors try to tag their opponents with controlled techniques. Oftentimes it requires such equipment as boots and full-hand cover gloves (also called chops) that absorb the force of the kick or punch when it strikes their opponents. In some cases no chest protector (hogu) is required. Most light-contact sparring, however, requires headgear and mouthpiece for protection in case of accidental hits. Light-contact sparring can be continuous – meaning that the match or round does not stop each time a point is scored – or point style, in which a point is awarded immediately after a strike is delivered successfully and the match is stopped. ATA and ITF dojangs are among those which participate in this kind of style. Sparring without any physical contact is the ultimate in self-control, because the participants must deliver kicks and punches that always come short of hitting their opponents. While sometimes protective equipment is sometimes worn, other times participants don’t wear any pads at all. When I was with the Colorado State Taekwondo Club, we practiced no-contact sparring. At first I was frustrated at the idea of not actually touching my partner, but after a time I realized the high level of control needed to spar in this manner. Since I was used to full-contact sparring, in which I had to score “trembling shock” (in other words, I had to physically move my opponent when I hit him – with chest protector on, of course), it was initially difficult to control my moves in this way. The downside to this kind of training is, of course, that sparring injuries still can happen, and with participants not wearing protection (especially at the lower belt levels when one is still learning to control), accidents are more prevalent. The upside is that you can participate without having to purchase expensive gear, and you do learn control pretty quickly! Step sparring is, essentially, a series of choreographed moves, in which one person (usually the attacker) delivers either a punch or a kick, and the defender then reacts in a planned manner. Step sparring can consist of one, two or three steps, generally. Most of the time, this looks like “sparring forms,” because both the attackers and the defenders know what’s coming. But this kind of sparring is of excellent benefit in a self-defense situation, as you learn how to distance (and respond to) a punch or kick. It also allows you to use controlled techniques at full speed with perfect control, since the partner knows what you are doing and is able to respond appropriately. Some dojangs also practice “one step free-sparring,” in which the attacker mixes up the different attacks and the defender also works on different responses. This is great training for self-defense situations. Whatever style of sparring you practice regularly, sparring is a great fitness tool to help you get in shape, hone your self-defense skills, and prepare for competition.